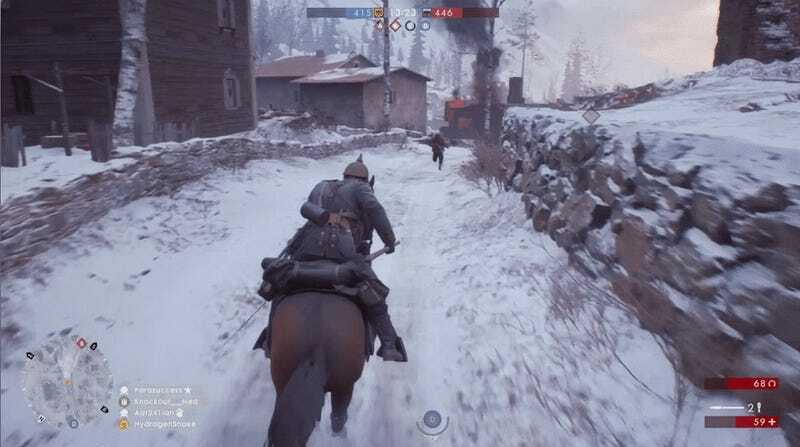 Battlefield 1’s latest expansion In The Name Of The Tsar adds the Russian Civil War to the game’s multiplayer with snow-swept maps and dangerous mounted cavalry. With a bleak atmosphere and expansive battlefield, it doesn’t just expand the game—it highlights what made it so compelling to begin with. One of Battlefield 1’s greatest strengths is a robust single-player featuring vignettes from various fronts throughout World War One. The multiplayer, while exciting, sometimes felt like it undermined the campaign’s gravitas by turning war into a carefree sport. In The Name Of The Tsar sidesteps this issue entirely. It boasts a collection of maps that are cruel, bloody, and capture the dire realities of the Great War. While the previous DLC They Shall Not Pass opted for a bombastic recreation of causality-heavy battles, the mood of In The Name Of The Tsar is much more understated. The six new maps are large but barren. Volga River features eight control points in Conquest mode stretched across an icy tundra barely punctuated by a few crumbling ruins, while Albion is comprised of a small collection of island with steep mountain cliffs. These maps are stark, with wide open spaces that snipers will love punctuated by enclosed control points that turn into a close quarters nightmare. The most striking new map is Tsaritsyn, a sprawling urban center where the White and Red Russian armies clash in a terrifying display. It features a single focal point, a massive cathedral that invariably draws both teams into an extended gunfight. Grenades clog choke points and multiple levels provide countless ambush angles. It’s one of the most terrifying and exciting locations in the game, and claiming it feels like a true accomplishment. Tsaritsyn is an interesting historical footnote as well. It is well known as the site of a Bolshevik victory led by Joseph Stalin. After the war, it was renamed Stalingrad. 18 years later, the Nazis would fail to claim the city during World War Two in a battle so costly it drove them from the Caucasus. There’s a weightiness to the map, a sense that this is one of the major fulcrum points of 20th century warfare. Alongside the DLC’s intense level design and rich history, In The Name Of The Tsar adds brutal weapons into the mix. The Model 1900 double barrel shotgun is punchy as hell while the Fedorov Avtomat gives the Medic class a highly viable assault rifle. There’s also the addition of cavalry spears that take the place of sabers. Mounted units can charge down infantry to impale them in a fantastic display befitting a Medieval battlefield. It’s rough stuff. During a particularly difficult push to capture a control point on Volga River, I snuck into a ditch and slit a sniper’s throat. Following that, I spun around to shoot his ally as he came over a ridge. Finally, another enemy killed me before a grenade blew him into the same ditch where all our bodies lay. In The Name Of The Tsar is the bloody, cold hearted expansion Battlefield 1 needed; it’s a standout addition that has finally rekindled my interest in the game. Where I found Battlefield 1’s multiplayer at odd with the campaign, my coworker Kirk Hamilton found a never-ending sea of bodies and death. In The Name Of The Tsar’s harsh locales and gory weapons help me see what he saw. The battles are exciting but they’re also terrible in their raw carnage. In The Name Of The Tsar’s content is currently available to Premium Pass holders and releases to all players on September 19th.